Sent 2016: A gathering of Mennonites planting Jesus-centered communities, was the first gathering of Anabaptist-Mennonite church planters of its kind. Mennonite Church USA and Mennonite Mission Network brought together church planters, groups testing the call, pastors, missiologists and conference leaders March 31-April 2, to explore approaches, best practices and the variety of perspectives that exist on church planting through an Anabaptist lens. This is the second post in a series from participants in Sent 2016. Olak B. Sunuwar was born into a Hindu family in Nepal and converted into Christianity when he was in high school. He taught at Himalayan Bible Training Centre, and was actively involved in church planting ministry and working for the Church’s unity and peace in Nepal. He worked among socially marginalized communities (ethnic minorities, drug abusers, refugees) in Hong Kong and led Nepalese Christian Council Hong Kong for several years. Now he is pursuing a doctorate in Christian Ethics at the Lutheran School of Theology in Chicago, and is involved in Living Water Community Church, helping with the Nepalese-speaking congregation. He is married to Mona, and together they have two daughters. Jesus Christ has given two important tasks for his people. The first one is the Great Commandment – loving God with all our heart and mind and loving neighbor as ourselves (Mark 12:30-31). The second one is Great Commission — preaching the Gospel and making disciples all around the word (Matthew 28:18-20). I believe that loving God and people through the work of peace and justice in the community is not complete unless we are sharing the redeeming power of Jesus Christ to fulfill the Great Commission. The Great Commandment and Great Commission of Christ are two sides of a coin — we can’t follow the Christ merely accepting one part. Without sharing the good news of Christ, Christian’s good works such as feeding poor, giving to those in need, helping the stranger and more are just doing philanthropy work which become the motto of many social clubs and secular organization. Sent 2016 reminded us of the Great Commission and the Great Commandment of our Lord Jesus Christ. It was very interesting to hear that many local church planters felt that we Americans are sending missionaries to plant new churches in foreign lands but we have forgotten our own land. I think our fellow Mennonite brothers and sisters felt urgency to preach the gospel of Christ and plant new churches in the USA along with good works inspired by Christ to show love and care to the community. Therefore, I believe that Sent 2016 combined our action and urgency to preach the gospel and plant churches in the USA. The Nepali group of Living Water Community Church in Chicago has been engaging with the non-Christian Nepali community in Aurora which is around 40 miles away from Chicago, helping the community with family counseling. Since the beginning of the 2015 we often visit them and have already built a good relationship with them. At the same time we are witnessing and sharing the love of Jesus Christ. There are many people who are ready to receive the gospel, but we have been wondering how to plant a church, since we were not aware of any guidelines for a church planting ministry. Literally we have been waiting for the Sent 2016 conference to get more ideas and learn how church planting functions within Mennonite Church USA and to meet the contact person for the church planting mission. It was helpful. I think Sent 2016 provided opportunities for church planters to share and hear church planting stories in different parts of the USA and among different groups. Overall the conference was about hearing stories and encouraging each other for the church planting mission rather than discussing practical church planting strategies and planning. Through hearing others’ stories about how God is working in the community, as well as the challenges we have faced and how we overcome those challenges, I realized that my church (LWCC) is part of this mission too, because we also have similar experiences where God has been faithful to us in our missional journey. The workshops were amazing! We explored different topics of church planting and mission that helped participants to understand the notion of mission. I think Mennonite Church USA took the right initiative – offering participants the opportunity to become familiar with situations in church planting and churches’ progress across the USA. Sent 2016 reminded us that loving neighbor is also telling them about the way of eternal peace and life – believing in Jesus Christ. I believe Sent 2016 refreshed and recharged church planters to preach the gospel and plant new churches. Thank you so much to the organizing team and church that kindly hosted this event. It’s an old trope: the lament that young adults are falling away from the church and a sense of despair for the church’s future. Last November, we invited readers to nominate people in their congregations under 40 who are committed to following Jesus, attend church and find value in Christian faith and community. We received more than 120 nominations of almost 90 individuals. From that impressive list of gifted individuals, we chose 20, seeking a mix of gender, racial/ethnic identity, experiences and geography. To read the full article, click here – 20under40. On Sunday morning December 7, 2014, the Living Water congregation walked out of the meetinghouse and into the street. We fell to our knees and lifted our hands, together insisting that Black Lives Matter. Several days earlier, a grand jury in New York City had failed to issue an indictment in the death of Eric Garner, who had repeated “I can’t breath” while a police officer held him in a chokehold before he died. Throughout 2015, we continued to lament, both corporately and individually, the deaths and sufferings of the many African Americans whose lives were cut short or were devalued through other means of injustice. In the fall, two women spoke at a Racial Justice Group meeting at Reba Place Church about their efforts to post Black Lives Matter signs. Their talk set in motion many conversations within our own congregation about the history and present realities of racism in our country, about the Black Lives Matter movement, and about the implications of hanging a Black Lives Matter sign. Many in our congregation initially came to the United States as refugees. These brothers and sisters from Cambodia, Nepal, Bhutan, Congo, Rwanda, Burundi, and elsewhere have much to teach the rest of us from their own experiences of responding faithfully to oppression, racism, and violence. We made sure that our discussions about hanging a sign included people of all language groups in our church, as well as members of minority groups who might be affected by the hanging of a sign in ways we hadn’t anticipated. The conversations are ongoing and have so far been deeply enriching and unifying for us as a church. While these conversations developed, some of us participated in protests after release of a video depicting the police shooting of 17-year-old LaQuan McDonald. It seemed a crucial time to make our collective voice heard in our neighborhood. On Epiphany Sunday, Pastor Kristin Jackson preached about Paul, a Jew with much privilege, who used his privilege to advocate for inclusion of the Gentiles. Together we read a litany and walked outside to see the Black Lives Matter sign unfurled. By hanging the sign we are stating publicly that as a congregation we affirm the value of black lives, which our society has too often to devalued. We express to black sisters and brothers in our church and neighborhood that their lives and experiences matter to us. The hanging of this sign is not intended to be an end in itself. Rather, it is an invitation and exhortation to each other and to our neighbors from all backgrounds to reflect more deeply, to learn and grow, to love our neighbors, and to work hard to affirm the value of people whose lives society has devalued. We long together for the day when it is no longer necessary to proclaim—with our voices or bodies or signs—that Black Lives Matter. We long for the day when all people understand that every life matters. Photo: Alice and Leah Kabira of Lombard (Ill.) Mennonite Church attended the Nov. 27 protest on Michigan Ave. in Chicago. Photo provided. When protesters shut down Michigan Avenue in Chicago on one of the biggest shopping days of the year, several Chicago-area Mennonites were among those chanting these words. On Nov. 27, a day often known as Black Friday, members of Chicago Community Mennonite Church, Lombard (Ill.) Mennonite Church and Living Water Community Church joined nearly 1,000 marchers protesting the police shooting of African-American teenager Laquan McDonald (McDonald’s autopsy revealed that he had been shot 16 times), and the 13-month delay in bringing charges against the police offer who shot him. This was not the first protest for Grimes, who traveled to Ferguson, Mo., in 2014 to be present after the shooting of Michael Brown, an unarmed African-American teen. Hilary Watson, pastor at Lombard Mennonite Church, blogged about her experience at the Friday protest. “If we call ourselves Christians, if we feel the force of the biblical call to protect the orphan, widow and foreigner, then we do not just condemn injustice, we interrupt it,” she wrote. For Watson, a particularly powerful moment came when protesters, walking down Michigan Avenue, began to chant, “16 shots.” At each intersection, protesters paused and counted to 16 before crossing the street. Spencer Foon, a member of Chicago Community Mennonite, found the protest an apt time to reflect and grieve. “As I was marching, it was also a time to mourn for Laquan and the string of other people in Chicago and other cities that have died,” he says. For many Chicago-area Mennonite congregations, working for racial reconciliation began long before the Black Friday protest. In 2014, in response to a call from a number of congregations in Chicago, members of Chicago Community Mennonite partnered with their sister congregation, First Church of the Brethren, to hang a large Black Lives Matter banner above the 290 Expressway that runs past their shared church building. In December 2014, members of Living Water joined several African American congregations in Chicago in walking out of their Sunday service and into the street for a song and short liturgical reflection, all while holding Black Lives Matter placards. Cyneatha Millsaps, pastor at Community Mennonite Church in Markham, Ill., says the Black Lives Matter movement has been a part of worship services, prayers and litanies. On Sunday, Nov. 29, many congregations held a special time of prayer for racial justice and reconciliation in Chicago. At Reba Place Church in Evanston, Ill., pastor Charlotte Lehman used McDonald’s death as part of her sermon examining the contrasts between “the now and the not-yet quality of the kingdom of God among us—a world in which individuals can be wonderfully transformed by the power of Jesus in their lives and a world in which our system of justice regularly perpetrates injustice.” During her sermon, she shared a picture from one of the week’s protests. Reba Place also has a racial justice group that works to educate the congregation about antiracism. Members of the group have met with local leaders of the Black Lives Matter movement in the Chicago area. Chicago Community Mennonite heard from people who attended the protest during their Sunday morning worship service; a service that also included prayers and a sermon that explicitly named recent incidents of police violence and support for the Black Lives Matter movement. At Living Water, Rebecca Larsen, who also attended the Friday protest, led the congregation in a time of prayer and offered a report of the event. Larsen read from Isaiah 59:14-15, verses she says have been “haunting her” for years. Living Water Community Church, a long-time MCC partner, is committed to developing their youth into leaders within their congregation and in the broader Chicago community. By partnering with several MCC programs, young adults are given the opportunity to explore their gifts while ministering to their diverse neighbors. According to Pastor Kristin Jackson, the congregation, which was founded in Rogers Park in 1995 by a group from Reba Place Church, is made up mostly of people who did not grow up in the Mennonite Church. It brings together people from different backgrounds and ethnicities, with more than four languages spoken regularly in their services. 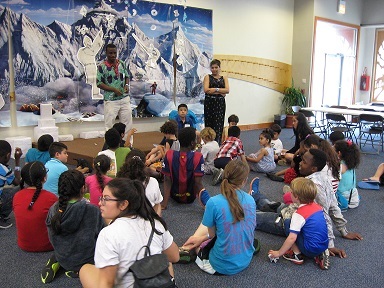 One of Living Water’s first partnerships with MCC began with the Summer Service program, a short-term MCC program that supports young people of diverse ethnic backgrounds in their development of leadership skills in their home congregations and communities. This program allows Living Water to employ young people for the summer, and because they don’t need another job, the participants can get more integrated into church life and the community. Three participants in MCC’s Summer Service program are spending several months this summer continuing this legacy of building bridges in the surrounding Chicago communities. Hafashimana Obedi and Jean Marie Bikorimana are working with refugee families in Rogers Park, focusing on partnering with resettlement activities. They, along with Nisha Darjee, are also working to support neighborhood outreach activities. All three helped as well with the congregation’s three-week-long summer day camp. According to Lamb, the program takes a different shape each summer, trying to take advantage of the students’ individual gifts in order to reach the different cultural groups that make up their community. Much of the students’ time is spent out in the neighborhoods working with brothers and sisters from their home countries such as Burundi and Nepal. According to Obedi, spending time with people from other cultures also enables one to find the similarities between different cultures, rather than focusing on the differences. The Summer Service program has given him and other participants the opportunity to build relationships they wouldn’t have otherwise. In addition, Obedi and Bikash Biswa, a previous Summer Service participant, had the opportunity to attend the Mennonite World Conference Global Youth Summit in Pennsylvania in July, thanks to a scholarship from MCC. The experience enabled them to connect with people from all over the world and get a broader sense of the worldwide Mennonite community. Coming out of the Summer Service program, MCC is also providing leadership development grants to the congregation for ongoing work after the summer session ends. The three participants will have several hours each week throughout the school year to focus on the projects they began this summer. This allows for continuity in relationship-building in the community, as well as continued personal development and reflection for the young leaders. Although now discontinued, Living Water also participated in MCC’s Church Community Worker program which gave grants to churches to employ individuals. Amos Shakya was one of the participants in this program. Shakya was at a point of trying to discern pastoral ministry for himself and specifically feeling called to minister to refugees from Nepal and Bhutan. “We didn’t have the resources to bring him on as staff, but MCC came around us,” said Jackson. Over the last decade, a number of young adults have also participated in MCC’s international year-long Serving and Learning Together (SALT) program. And the congregation has hosted various MCC events such as the recent Peace Gathering last spring. 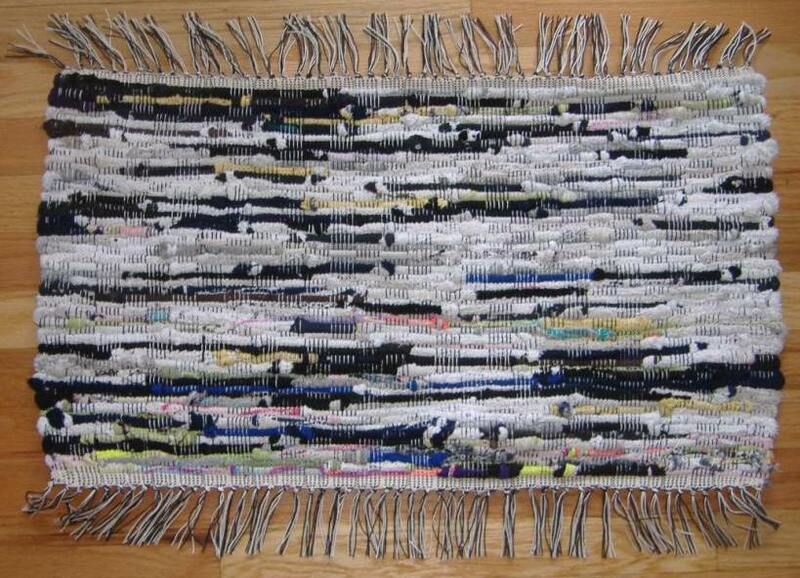 This fall, between worship services, there will be an opportunity for people to tie knots in an MCC comforter top. With the wide mix of languages in the congregation, this a project that crosses language barriers. The ongoing partnerships between Living Water and MCC is one step in building some of those bridges and equipping young leaders. On the Sunday after Labor Day in September, 1995, a group of about forty adults and as many children gathered for worship in the borrowed upstairs fellowship hall of a church on the north side of Chicago. The air was full of nervous, excited energy. Some of us had been praying and planning for this day for years, and now we were finally doing it: a real Sunday morning church worship service, in OUR neighborhood, worshipping God with our neighbors at a place many of us could walk to! Thus began a 20 years-so-far adventure for Living Water Community Church, a Mennonite congregation that reflects the diverse beauty and messiness of Rogers Park, the Chicago neighborhood that is our home. Since then, we’ve grown: in numbers of worshippers and, even better, in stories of God’s faithfulness. And now we are celebrating! Please join us for our 20th Anniversary worship service on Sunday, September 13 at 9:30 am, and for a party with picnic and music and dancing afterwards. Look what the kids made at VBS this year! Families were asked to bring socks, VBS volunteers cut them into loops, and the kids knotted them together like rubber bands. 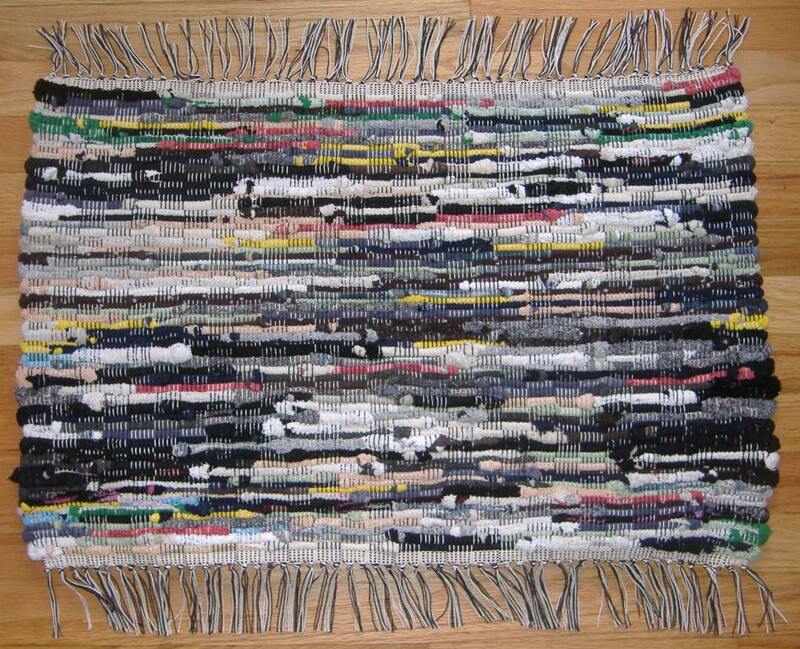 A spontaneous contest arose as to who could make the longest chain of sock loops. 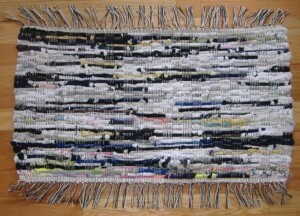 Then, with the VBS students watching and participating, we wove the socks into these beautiful rugs. The kids were in awe of the two-harness loom and especially enjoyed banging the beater bar against the woven material to make a tightly-woven rug. 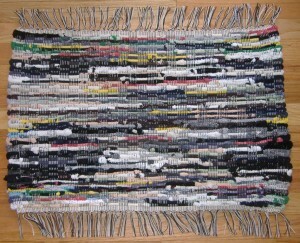 Eventually these rugs will go up for silent online auction – and there will be at least two more of them that are in the “looped” stage and have not yet been woven. Outgrowing homes, the Nepali house church has begun meeting Saturday afternoons at Living Water Community Church’s Meetinghouse. 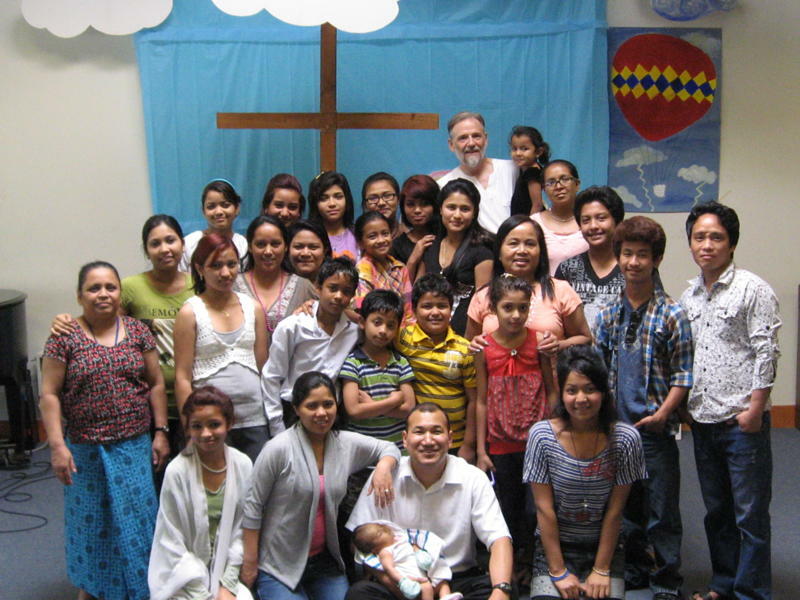 When the Darjee family arrived in Chicago in January, 2010 from a 17-year sojourn in a Nepali refugee camp, a Nepali-speaking MCC church community worker welcomed them into the local Mennonite Church, Living Water Community Church. MCC worker Amos Shakya had arrived in the U.S. two years earlier under Youth with a Mission sponsorship, coming with a desire to extend evangelism and discipleship training to recent Bhutanese/Nepalese refugees. Amos’ journey with Jesus began with a Gospel tract handed to him by a stranger on a path leading to the cornfields near his village. He was captivated by the message in the tract that quoted John 3:16. Several months later, he moved to his sister’s home in Katmandu and decided to attend the church identified on the back of the tract. As the Lord spoke into his heart at this church, Amos sought baptism four months later. He dedicated himself to work, Bible study and outreach activity for three years before entering a six-month formal training program on faith discipleship conducted by Youth with a Mission (YWAM)-Nepal. He then accepted a staff position as Campus Minister with YWAM-Nepal with a focus on evangelism and faith discipleship. Additional certification programs with YWAM took him to Bangalore, India and Bangkok, Thailand. In August 2008, he entered the U.S. as a student at the Bible School for the Nations conducted by YWAM-Wisconsin. 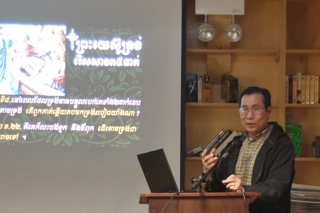 He next worked on evangelism and faith discipleship among recent Bhutanese-Nepali refugees in Boston, MA. On a trip to Chicago, he felt drawn to reach out to the growing Bhutanese community there. He stayed with Bhutanese friends who had been attending Living Water Community Church. He made connection with LWCC leadership while also growing acquainted with more of the Bhutanese/Nepali community in Rogers Park. Nepali believers share in heartfelt worship at Living Water Community Church, led by Roma and Amos Shakya, pictured at far right. Living Water Community Church, a Mennonite church planted in 1995 to reach the multicultural Chicago neighborhood of Rogers Park, found itself well situated to welcome these new immigrants and house English classes conducted by the Nepali Association. MCC’s Church Community Worker program enabled LWCC to add Amos to its part-time paid pastoral staff from September 2010 to August 2012. Partnering with his dynamic wife Roma, whom Amos wed in 2011, the Shakyas lead a Nepali house church which worships and studies the Bible Saturdays in their native language. Many of these house church participants also attend Living Water’s Sunday morning English service. Twelve Bhutanese adults have been baptized into membership in LWCC since Amos came on staff. They reach out eagerly to family and friends, increasing growth in the mother church. The Darjee family’s journey to faith in Christ makes an interesting case study. Father Buddhiman (“Bhuddi”), mother Tanka Maya and their six children were forced off their farm in Bhutan by soldiers just as planting season ended in April 1992. With their limited funds, they rented a truck with another family and fled to Bader, India. After a brief stay with relatives, they rented another truck and sought refuge in the United Nations’ “Beldangi 1” camp in the Jappa state of Nepal. Their entire Lhotshampas people group had been expelled from the largely Bhuddist country of Bhutan in an ethnic cleansing action against Nepali-speaking Bhutanese. Nepal did not want these 100,000 stateless people either, and denied them opportunity to find work outside the camp. During their first two months in the camp, cholera took many people’s lives. Tanka was constantly ill. She sought prayer from the Hindu highest priest in the camp, but did not find healing. She began attending church with friends in the refugee camp, hoping to find healing there. Her husband, a Hindu priest since the age of 20, said to her, “Fine! Go get healed.” Tanka accepted Christ and was baptized. Over time, she noticed some of her illnesses departing. When Tanka arrived in Chicago, she still experienced some illness. A Bhutanese Christian friend, Sukmaya, brought her to Living Water where she met Amos and began her discipleship journey to more deeply understand and follow Jesus. 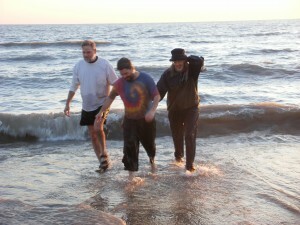 Now mostly healed of her illness, Tanka radiates joy, a giving spirit, and a warm welcome to others. When her husband Buddhi saw the change in Tanka’s life, he became interested in becoming a Christian. He studied the Bible with Amos and other believers and was baptized in October 2010. In his work as a tailor, he would often talk to customers about Christ. Their oldest son Tikaram “Tika” also became a Christian because of the changes he saw in his mother, father, siblings, wife and children who had all become believers. Earlier when his wife Chandra started attending church in Nepal, he became so angry he said he would build a dividing wall in their house and live on a separate side from her. Since he was baptized, Tika has noticed a difference in his thinking and in his capacity to love others. His favorite scripture is Jesus’ parable to build one’s house on rock and not on sand. The Nepali believers add to the strong foundation being built at Living Water to welcome people of many nations. 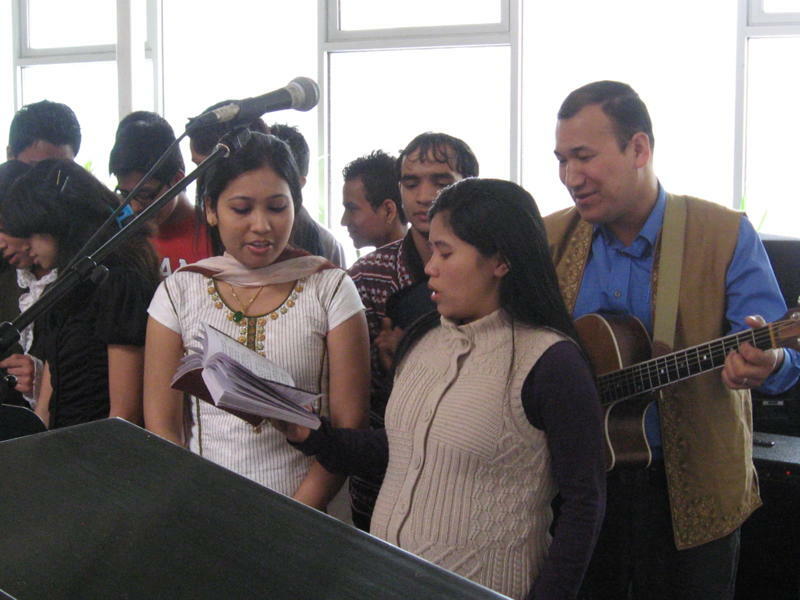 Members of the Nepali house church lead worship at Living Water once a month with scripture readings and prayer offered in Nepali. This service has become an important outreach to non-believers in the neighborhood. They have taught other attendees how to pass the peace of Christ in Nepali. 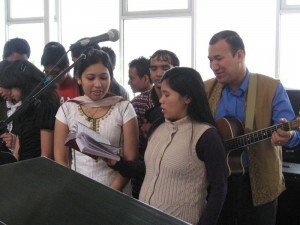 They also hosted the church’s annual Christmas caroling party in several members’ homes, and presented a Nepali cultural dance at LWCC’s Christmas Day worship. Now attracting 25-40 worshipers per week (including many teenagers), the weekly Saturday Nepali house church changed venue from members’ homes to the Living Water Community Church meetinghouse on June 9. 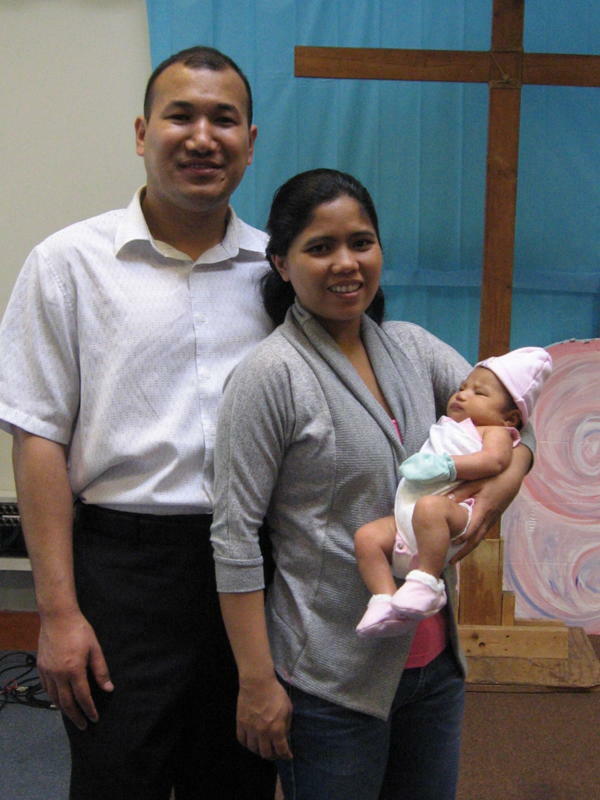 Leaders Amos and Roma Shakya rejoice over the safe arrival of baby Yarona Jyoti, born May 3, 2012. The united body at LWCC rejoices over recently answered prayers for two important concerns in Amos and Roma’s family. As MCC’s two-year church community worker partnership grant comes to an end, LWCC members have voted to increase their financial commitment to Amos as a valued church leader. Their petition to the U.S. government to extend his R-1 religious worker visa to August, 2013, switching from sponsorship by Youth with a Mission-Wisconsin to LWCC, was granted on April 30. Three days later, Roma gave birth to their first child, Yarona (“sing” and “rejoice”) Jyoti (“light”) Shakya. Despite prenatal diagnosis of a heart ailment, Yarona was breathing on her own and able to go home with her parents a few days after birth. Through birth and new birth, God continues growing the multicultural family at Living Water Community Church. Many people have asked what it means to be an Anabaptist Christian. In coming to understand this way of life, I have been grateful for the wisdom and life example of Sally Schreiner Youngquist. Sally leads LWCC’s Fellowship of Rogers Park cell group, which is also a part of Reba Place Fellowship. She currently serves as community leader of RPF and was a founding pastor of LWCC from 1995-2009. Here is her description of being Anabaptist. RPF founder John W. Miller named Mars, Mammon and Me as the prevailing idols in our society. I can see how media, government and the economic engines of mass consumerism breed conformity, captivity and fear within our culture of individualism and so-called free choice. It takes a group effort to resist these powers. I have thrown in my lot with one such experiment for 40 years, learning practices of communal resistance. Worship repeatedly calls us to declare our allegiance to Jesus before family, country, and way of life. Group discernment lends wisdom and accountability to major decision-making. Pooling our income and living on Voluntary Service-type allowances provide us with what we need while challenging our greed. Locating ourselves in urban areas where violence flares calls us to prayer and peace-building efforts with neighbors. Intentional proximity, table fellowship, evangelistic welcome and mutual aid are shared among people of diverse incomes and backgrounds in our surrounding congregations—Living Water Community Church and Reba Place Church. Through such communal practices we live into Jesus’ new way of life. Our mistakes are legion and our learning process slow, especially as we wrestle with the entrenched power of racism within and around us. “Seeking first the Kingdom” requires faithfulness over the long haul, with many bouts of failure. Yet we are encouraged to see Jesus raising up a new crop of Anabaptist-leaning intentional communities these days as demonstration plots of the now/not yet Kingdom.